May 24, 2016 @ 09:00 AM — by Sharon B. Mateja, D.D.S. If tooth loss is causing you to feel self conscious about the appearance of your smile, you can undergo treatment. Restorative dentistry treatments can replace missing teeth, restoring your oral health and dental function. To find out which treatment for missing teeth is right for you, schedule a consultation with Rancho Cucamonga, CA dentists Sharon B. Mateja and Brenda Kueckels. Dental implants are the most permanent solution for replacing missing teeth. Dental implant treatment requires the surgical placement of small, titanium posts into the jawbone. These posts act like the natural tooth root and can be paired with different dental restorations to replace one or more missing teeth. Dental implants with dental crowns: Individual teeth can be replaced with dental implants paired with dental crowns. Although multiple teeth can be replaced in this manner, those missing more than two consecutive teeth are better candidates for other restorations, such as implant-supported bridges or implant-supported dentures. Implant-supported bridges: Those who are missing three or more teeth, but not a full arch, may be suitable candidates for implant-supported bridges. 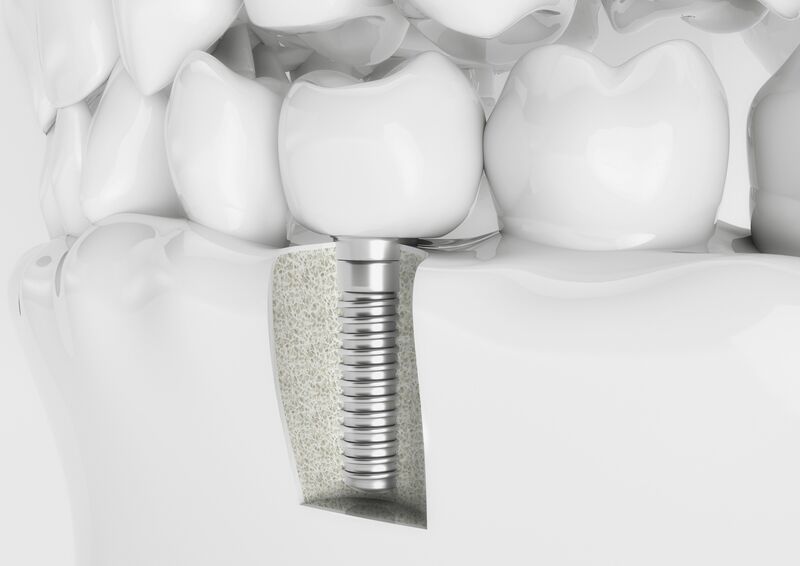 Implant-supported bridges attach to dental implants to replace missing consecutive teeth with one restoration. Implant-supported dentures: A full upper or lower set of teeth, or both, can be replaced with implant-supported dentures. Implant-supported dentures attach to three to five dental implants to anchor the dentures firmly in place. Implant-supported dentures eliminate the need for messy adhesives and allow denture wearers to enjoy their favorite foods without fear of their dentures slipping and sliding. Dental bridges, sometimes called partial dentures, can be used to replace one or more missing teeth. Traditional dental bridges are made of two dental crowns joined by one or more artificial teeth. The crowns are attached to the teeth adjacent to the space left by the missing tooth or teeth. In some cases, metal wings may be used to attach a dental bridge within the mouth. For those who are missing a large number of teeth, but not enough to require a full set of dentures, a dental bridge may be paired with dental implants, as described above. For those missing a full arch of teeth, dentures are a great treatment option. Dentures are custom-made restorations that consist of a full set of artificial teeth set in acrylic gums. Traditional removable dentures fit snugly in place but may require special denture adhesives to stay in place. Because traditional, removable dentures may slip throughout the day, many patients prefer implant-supported dentures. Implant-supported dentures attach to three to five dental implants for a secure, slip-free, comfortable fit. Because there are surgical and non-surgical options for the replacement of missing teeth, anyone who suffers from tooth loss is a candidate for tooth replacement treatment. Those who wish to undergo more permanent tooth loss replacement with dental implant treatment should be healthy enough to undergo surgery, have relatively healthy gums and remaining teeth, and should not smoke. To learn more about your treatment options, we invite you to schedule a consultation with Dr. Mateja or Dr. Kueckels.